The fruit of the persimmon tree has an interesting feature. Two types of persimmon trees, one native to the United States and another native to the Mediterranean, produce fruit that is so astringent when fresh it cannot be eaten. Then, after it is softened by frost, it becomes wonderfully sweet. Another persimmon tree type, native to the Orient, produces wonderful sweet fruit that can be eaten as soon as it ripens. The Japanese or Oriental persimmon tree (Diospyros kaki L.) does not produce fruit with the same level of astringency as the American persimmon. There are hundreds of varieties, but the types most commonly grown for fruit production are: Fuyu, Jiro, Gosho, Suruga and Eureka. They are small trees that only grow to 20 feet, but are long-lived. The fruit ripens in the fall and can be gathered and eaten off the tree when ripe. Japanese persimmons are often grafted to the root of the American persimmon for disease resistance. The Japanese persimmon is hardy to 20 degrees F.
The American persimmon (Diospyrus virginiana) grows wild across the southern United States. The fruit is small and so astringent that it cannot be eaten until after it is exposed to a hard frost. Once a hard frost softens the fruit, it becomes very sweet and is fought over by a variety of wildlife. It can be used in cooking or eaten raw when it is found hanging on the tree or laying on the ground. The wood of the American persimmon is very durable and is often used to make golf clubs and tools. The leaves turn a brilliant yellow in the fall. The American persimmon often creates thickets as it spreads by root suckers. The American persimmon is hardy to 0 degrees F.
The date plum (Diospyros lotus) can grow up to 90 feet tall in some areas and gets its scientific name from the lotus-shaped blooms it produces in mid-summer. It is native to the Middle East and Mediterranean. 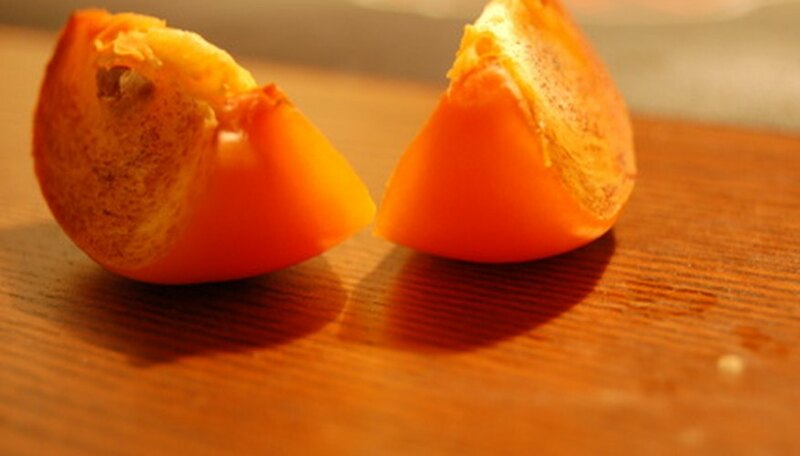 Like the American persimmon, the fruit must be fully ripe before it can be eaten due to the high level of astringency in the unripe persimmons or date plums. The date plum is such a desirable fruit that the Greeks called it the "Fruit of the Gods." The date plum persimmon is hardy to -15 degrees F.